Much like a football team that keeps bringing the blitz, eventually their opponent is going to smarten up and burn them for being overly aggressive. Poker players who try to bully the pot by betting big, in order to scare off players with weaker hands – or what they are led to believe are weaker – can come away with some big wins. But just like in life, stepping up to the bully often leads to them taking a fall. There’s nothing wrong with being patient and picking your spots, rather than trying to go all-in on every hand. Finding that balance is the key to success in poker. Believe it or not, bluffing happens far less in poker than we’re led to believe. It takes a perfectly played hand, expert timing and betting, and ice water in your veins to bluff big. And even then, you’re not guaranteed a winner. The key to bluffing is reading the table and seeing how confident other players are in their hands. If the bets don’t come out hot and heavy, the window may be open to bluff. But do it too much and like any lie, you’ll get caught. Yes, the cards you’re dealt have the biggest impact on whether you win or lose a hand. 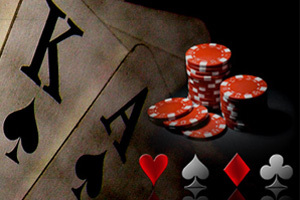 Pocket Aces is a random act of kindness from the poker Gods. However, knowing how to play that mighty hand and draw in as much money from other players is all skill. The same can be said with reading and understanding probabilities, given the cards in your hand and the ones showing. Sharp players can get a good idea of what might be against them. Recognizing betting patterns and what they mean for an opposing player is also a trick that doesn’t just randomly fall from the dealer’s hand. The luck of the draw is just the beginning in most poker games.